I really love running (more correctly – jogging). I am not super good at it and I don’t know if I’ve ever even got a “runner’s high” but I get grouchy if I am not active and more importantly, I LOVE being outdoors. The feel of fresh air is always great and coming across the wonderful little visual treats that nature provides is really where it’s at for me. A great example of one of these treats is the leaf/seed things we came across while jogging the other day. They were gorgeous and delicate and made me think of butterfly wings. We stopped to pick a handful’s worth out of the grass (yesterday I went back and filled up a bag) and I immediately began thinking of how I might create with them. 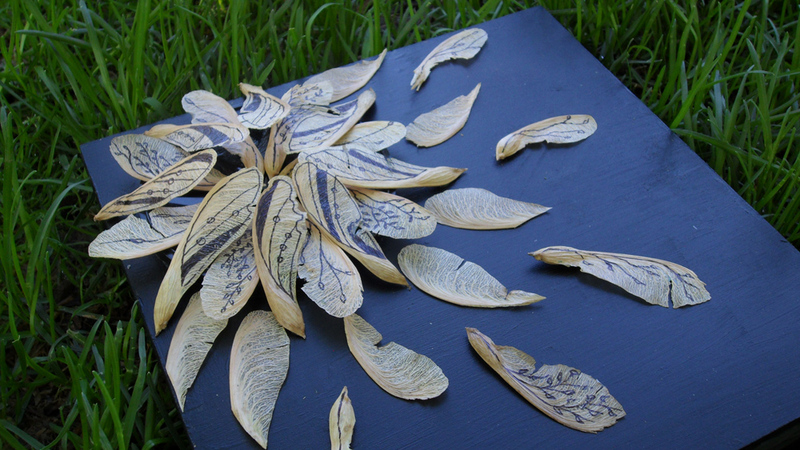 After experimenting a bit – laying them out in different ways, contemplating how they might be molded around a 3D object – I started thinking of each leaf as a mini canvas. I coated them with clear acrylic and began drawing. 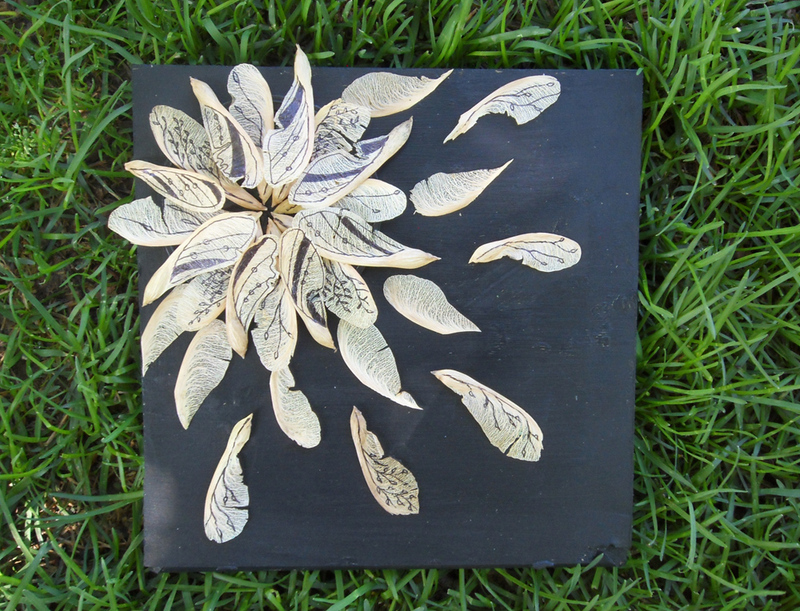 The final day ten project is this floral-like design. It could be pushed a bit further and as I become more familiar with working with these little treats from nature, I’m hoping this will happen. 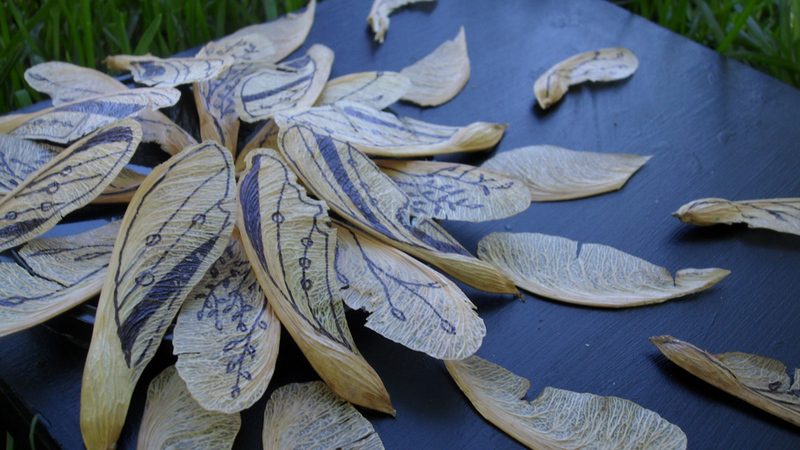 Also, if anyone knows the name of the tree these great leaf/seed things come from, I’d love to know. I must say this is my favorite so far! Can it be framed in a shadow box? Beautiful!! 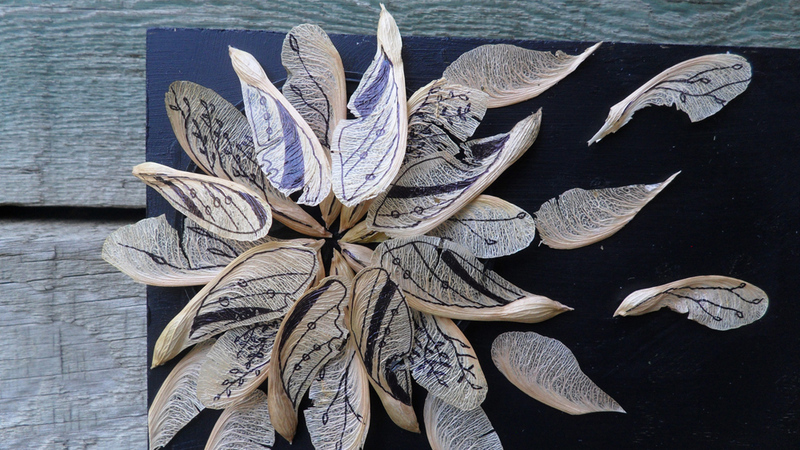 They look like some type of maple seed. They fall from the tree attached in pairs and spin around slowing their fall and allowing them to be carried more by the wind to be dispersed further from the parent tree. Oh awesome! Maybe I’ll take a picture of the trees near where i found them and send it to you so you can verify for me. Gracias! I would guess it could be…I may even have one sitting around the house somewhere to experiment with. I think they come from maple trees, fun fact if thrown in the air they spin like a helicopter.